Dedicated: Hindu temple dedicated to Lord Shiva. Another important and massive temple built by the Hoysala dynasty is the Hoysaleshwara temple in Halebidu. The massive temple was built by the Hoysala ruler King Vishnu Vardhan in 12th century in Halebidu which was a capital of Hoysala dynasty. The construction of this marvellous and magnificent temple was completed in 1160 CE. The temple is also known as Halebidu temple attracts thousands of tourists every year. The temple has two shrines one dedicated to Hoysaleshwara and Shantala Devi( named after wife and queen of King Vishnuvardhan). The temple is facing towards east and has two Nandi Shrines in front of both the temples. Both the temples have Shiva linga inside the temple. The temple also has another important shrine dedicated to Sun God. Hoysaleshwara temple has been beautifully carved and designed using soap stone. There are about 340 large images which depict about Hindu mythology of Ramayana, Mahabharata and Bhagvad purana. Hoysala Empire ruled the state of Karnataka, India from 10th to 14th century. During this period the rulers of the empire who ruled South India built around 1500 magnificent temples in 958 different centres. Even though the city of Halebidu was ransacked and demolished by the army of Delhi Sultanate still the temples have not lost its beauty and sheen. Earlier Belur was the capital of Hoysala Empire but later Vishnuvardhana moved his capital to Halebidu which served the empire as capital for nearly 300 years. Many inscriptions and carvings of the temple have been destroyed during the invasion of Delhi Sultanate. During Ala ud din Khiliji period both Belur and Halebidu was plundered, destroyed and ransacked. The territory was however taken over by Vijayanagara Empire which did lot of restoration work of the temples in Belur and Halebidu. From the remains found it is believed that the temple was built by Ketamalla who was one of the officer in King Vishnuvardhana court. Hoysaleshwara temple was one of the largest temples built by Hoysala Empire in South India. The temple has four entrances and the north entrance is the main entrance through which tourists can get inside the temple. The temple is a mixture of North Indian Nagara and South Indian Karnataka style of architecture. It is has ekakuta vimana design. Along with the four entrances, dvarapalas were added. 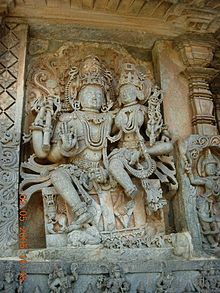 These dvarapals are wearing huge jewels and also has four arms. One can see a large image of Lord Ganesha on the southern entrance. Hoyasala’s architecture is one of the most outstanding and marvellous. Hoyasala built the temples between 10th to 14th centuries which are famous even to this day. 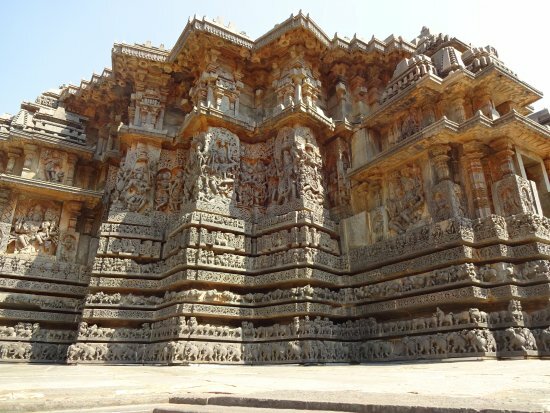 Temples built in Belur and Halebidu are the best examples of Hoysala style of architecture. The Hoysala’s usually dedicated their temples to Lord Vishnu and Lord Shiva and also built some temples dedicated to Jain worshippers. Most of the temples that were built by the Hoysala had themes based on Hindu mythology in their sculptures. The hoysaleshwara temple is built on a raised platform called as jagati which is around 15 feet wide around the outer walls of the temple. This is also the pradhakshina patha of the temple. Like the Belur temple even this temple is built on a star shaped platform. The temple is built in soap stone which helped the artists to do beautiful carvings on the walls of the temple. The towers on both the sanctum are missing and also the superstructure which connected the shrine to the mantapa known as sukanasi is also missing. Probably all these were destroyed during the invasion of Muslim rulers. The outer walls are the most beautiful part of the temple. They have intricate carvings all around. The lower part of the outer wall has horizontal strips or Friezes of animal like elephant, lion and the scenes from Hindu texts. The horizontal strip on the outer wall is predominantly depicting stories of Ramayana, Mahabharata and Bhagavad Purana. One can notice that no two sculptures are same. Some of the other various and important carvings or horizontal strips include lord Krishna lifting Govardhan hill, Lord Krishna stealing butter or playing flute while animals and gopis are dancing to the tune, Lord Ram killing the golden deer. Towards the south west of the Lord Shiva temple one can see the episodes from Mahabharata, Mohini doing dance and many more. These carvings or the horizontal strip are truly breath taking and has overcome all the invasions and still standing magnificently welcoming thousands of tourists every year. The interior walls of the temple are quite simple and plain as compared to outer walls. The pillars inside the temple are plain with not much of any carvings on it. The most important pillar is the garuda pillar which is located to the south of the temple. The top portion of the pillar is damaged. This garuda pillar or stambha depicts the stories of the body guard who lived with the kings in ancient days. Some of the bodyguards committed suicide after the death of their masters and hence this pillar pays homage or respect to a bodyguard by name Kuruva Lakshma who killed himself on hearing the news of death of his master. Some of the artists who helped in building this magnificent temple include Ballana, Mabala, Manibalaki, Ketana, Bama and many more. Summer months are quiet hot in Halebidu. Temperature would hover around 40oc. Summer months are from March to May. Monsoon is from June to September where the place receives heavy rainfall. Winter is from November to February where the weather is pleasant and the temperature would hover around 25oc. Around March and April, Hoysala Mahastav takes place which is a festival of dance and music. Artists from all over country come and participate in the festival. 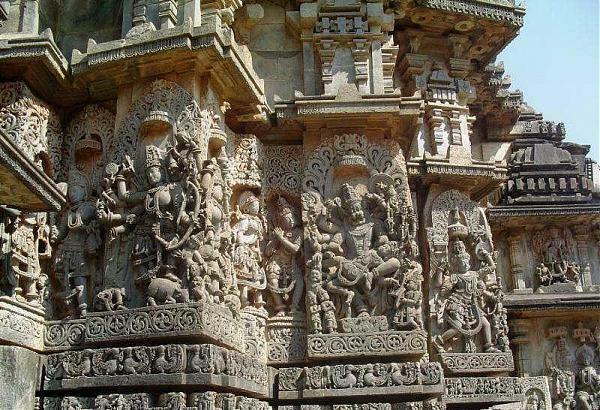 It is the best time to visit Belur and Halebidu during this festival period. Best time to visit is from October to March. 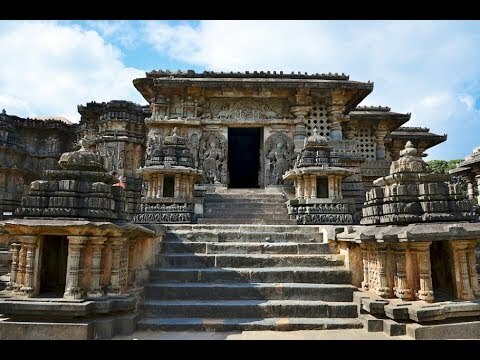 Kedereshwara temple: Another masterpiece from the Hoysala architecture is the Kedereshwara temple in Halebidu. The credit of this temple goes to Veera Bhalla II and to his wife Ketaladevi. The temple is dedicated to lord Shiva and it is constructed in soapstone. Even this temple stands on a platform called as jagati which is the pradakshina patha for the temple. The architecture of this temple is quiet similar to that of Hoysaleshwara temple. Halebidu is well connected by road and rail from the major cities of Karnataka India. The nearest airport is Bangalore which is around 200Kms. It is around four hour drive from NH75 highway.